Create a grid approximately 10X20 yards. Two players start on the corner cone opposite each other. One player starts in the center of the grid. 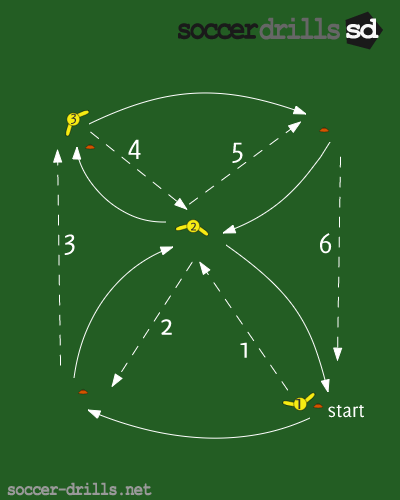 Player 1 starts the play by playing a ball into the central player (Player 2). Player 1 moves to the cone to his side that is placed 10 yards away. The central player (Player 2) plays a first time ball back to Player 1 while he is moving into space. After Player 2 returns the ball to player 1 he takes his place at the cone where play started (Player 1’s original starting position). Player 1 plays a long ball to Player 3 and moves into the center of the grid to become the new central player. Player 3 plays into Player 1 who returns the ball to player 3 at the cone placed 10 yards away. Player 1 now takes the starting position of Player 3 while Player 3 plays a long ball down to the starting position and Player 3 becomes the central player. Good controlled approach to the ball facing the pass direction. Focus on good quality of touches with the correct pace and weight on the pass. Play with speed, communicate, and move early. Make sure players are timing their runs by bending the run slightly if needed.